Close to the airport. Very impressed with the cleanliness of the linens, room and bathroom. Has a fridge in the room as well as travel sized supplies in case you forgot yours. It was really clean! Bed was really comfy! The stay at our hotel was nice. It was all that we were looking for. Just somewhere clean and safe to stay at. The benefits were, there was a continental breakfast every morning, which was nice and a computer that you could use in the lobby, so I could e-mail my family to let them know I made it safe. The staff was very helpful when we asked questions about how to get to certain amusement parks, stores, restaurants, etc. Overall a very nice experience. It was clean and the staff was very helpful. The parking spaces were a little small. Location is one great feature of Ramada Limited Sea World Hotel. Two minutes away from SeaWorld, the family will love to be so near to the fun. The business traveler will appreciate a location so near the airport. The hotel will meet up to your expectations with the free services offered that include airport shuttle, high speed internet and breakfast. 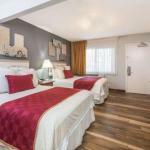 The clean and quiet rooms will ensure a worry free and enjoyable stay in the city. A nice sleep for a great day. The hotel offers many free services, including breakfast, high speed internet access, parking and local calls. Relax at the outdoor pool after an exciting visit to Sea World. The hotel offers a free shuttle service from and to the airport. Stop by the cocktail lounge and read your favorite book or newspaper. Dont hesitate to arrange your conference at one of the meeting and banquet facilities. Great location by the airport, the hotel offers services hard to find free of charge at other hotels. Rooms are big and clean. There are many varied restaurants in the neighborhood. The breakfast is simple but good. It is very near Seaworld. It is a great inexpensive hotel.